Would you like to help keep this site up and running? While membership is free, we have to pay annual hosting fees. Your contributions of any amount are most appreciated. Donations possible here on the home page, as well as on your reunion registration. Please donate to help with ongoing expenses like the website as well as reunion overhead costs such as printing and postage. Thanks for your support! Hope you can attend. Share your photos related to AHS. email photos to info@ameshigh.org. Thank Ed Hendrickson 1974 AHS. Tell as much about the photo as you can. People love photos. If you want to keep receiving class emails and announcements, please update the email address in your contact information. It seems people change emails frequently, so when we send announcements -- such as "In Memory" emails -- we get several bounce backs. Don't miss out on important emails and announcements. If you're unsure what email is listed, log in and go to Member Functions > Edit Contact Info and check it now. Your information is password protected and be assured that we do not share or sell your information. If you are a friend of our class (such as class of 1979 or 1981), please send us a message. On the left menu bar, please select "Contact Us" and provide your name, email address and a message. An administrator will contact you soon and help you sign up on the page. 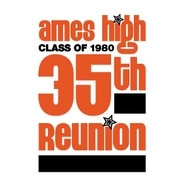 Welcome to the Ames High Class of 1980 Website! Find your name in Classmate Profiles in the menu at left. Clicking on your name will take you to the "Join Here" page. On the "Join Here" page, click on the text link that says "'click here now' to create your profile" and follow the instructions to set up your login. After you have created a login, you can view classmates' profiles, the yearbook, scrapbook and other exclusive classmate pages. Be sure to update your contact information NOW so you don't miss any emailed announcements! Please bookmark this site and keep checking back for the latest news and to see how many more classmates have joined! Please complete a survey, even if you weren't able to attend. We need everyone's feedback. We are so happy that many were able to join us for the reunion in 2015. We had a blast including alumni from classes of 1979 and 1981,this year. Even if you are unable to attend, please consider a donation of $5 to $10 to help with ongoing expenses (e.g. $120 every year for our website and domain name.). The reunion itself has some overhead such as printing and postage (over $400, $500 deposit for Scheman, just to mention a few). Names of donors (but not amounts) will be acknowledged on the Homepage. If you prefer your name is NOT listed, please send an email to Kathy. (ahs1980kathyvannoy@gmail.com).